What to Look for When Buying a Dog Car Seat? 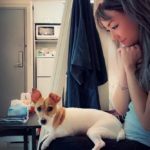 Does My Dog Need a Car Seat? Best Car Seat for Large Dogs? We’re going to bring up the same argument again by saying our dogs are members of the family and many of us pet parents equate them to our children. If you have a child that needs a car seat, there’s a good chance your pup does too. Dogs should also be properly restrained during the car ride because they are at risk of the same injuries and dangers we are. 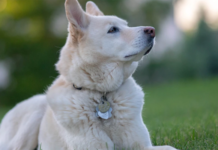 At any size, an unsecured dog could be a danger to themselves, and to you. There are several types of dog seats on the market for different sized dogs and for different weights. 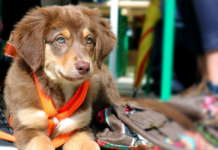 Introducing your dog to any sort of device, clothing, or safety equipment of some sort is best done at a young age. A car seat is very necessary for their safety, but another reason for a car seat is to protect the interior of your car. Whether you drive an expensive Beamer or just a humble but very functional car, scratched up leather is not a good look. Let’s take a look at our top 10 picks for best dog car seats in 2019. This doggy car seat has fur lining to keep stray hairs from turning your leather interiors into carpet. To lock it in place, there is 1 adjustable strap that fits around the back of the seat. In addition to that, there is another adjustable strap that fits around the headrest to keep your dog securely anchored. 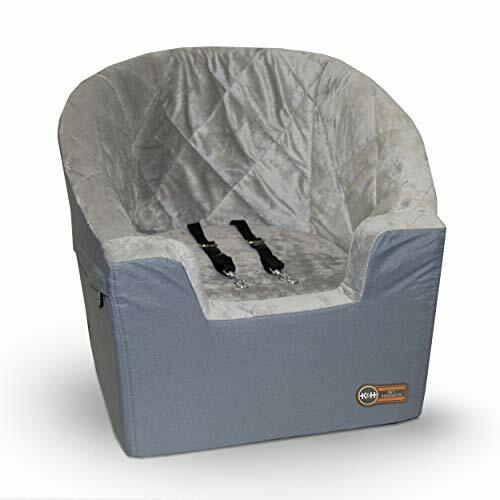 If you need to remove the dog booster seat for another human family member, the collapsible metal frame is easy to store. The removable plush liner is easily cleaned by hand, or in the machine. This kind of dog booster seat holds dogs up to 15lbs. Why We Like It – If by any chance your dog does not fit, Devoted Doggy will refund your purchase with no questions asked. 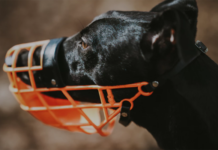 They stand behind their products and do their best to put a smile on your and your pup’s faces. Just look at this comfortable design! I know I feel a slight pang of jealousy that my dog gets to snuggle in such a comfortable car seat. It might as well be a couch or a bed! This comfortable foam form is, of course, one of this car seat’s most appealing characteristics. The faux lamb wool interior will keep your dog warm and comfortable in cold weather. Even though it looks insecure, there is a connection strap included for the seatbelt to latch onto the harness so the seat is securely in place. 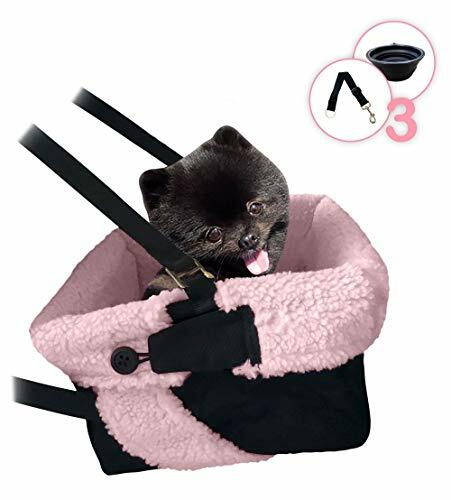 There is a variety of colors and fabric options to choose from, you can easily match this dog car seat to the interior of your car. Why We Like It – Feel as calm and comfortable as ever in knowing your dog is safe and all snuggled up beside you in this car seat because he or she will feel exactly the same riding in it! This dog car seat will provide a cozy and safe space away from home. This booster pet seat comes in two sizes to give you more options for those with bigger dogs. The seat of the car seat is higher and elevates your pup so he or she won’t strain their necks trying to look out the window or yap at the dog in the car next to you. This is considered a safety feature, as it will distract your pet from obstructing your view or bother you while you’re driving. This seat fits in the front or back seat depending on your pup’s preference and with two adjustable security leashes, this booster pet seat will stay in place. Don’t worry, the cover is also removable and washable, so don’t worry if your pup gets a bit car sick. Why We Like It – With this pet booster seat, you get a one-year limited warranty. The contoured back of this seat fits the seat of your car flawlessly. The soft three-inch cushion foam will give your pet the feeling of home. Similar to the design introduced above, this concave design will keep your pet in place. 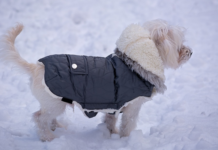 The quilted flannel plush lining will give your pup the snuggly comfort it craves, and the durable fabric along the sides and bottom will keep from ripping. The two adjustable security leashes on the inside are similar to those used for children and will keep your pet safe. The cover and removable cushion are machines washable of course and easy to clean. 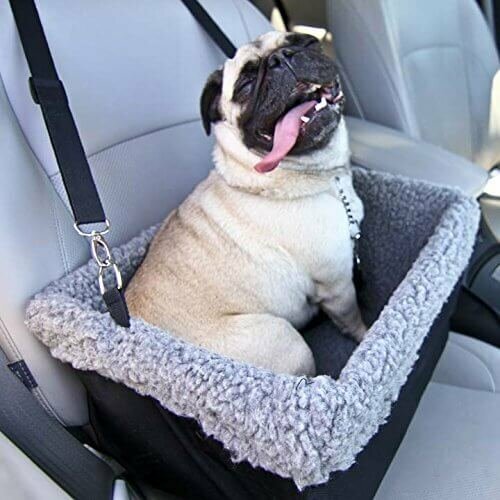 This car seat will make car rides more fun and comfortable for your dog, and less worrisome for you! Why We Liked It – This seat fits into the front or back of a vehicle. The installation is very easy with the security straps hooking right into your seatbelt. The seat also has a security leash to latch to your dog’s harness for added security. This car seat looks comfy and sturdy at the same time. The seat pillow is removable for those with slightly larger dogs but doesn’t fit into the next size up. The soft microsuede cover and removable plush pillow are machine washable and easy to clean, so it’s alright if your pet has accidents in the seat. The booster seat is large enough to accommodate two pets and has a safety tether that easily hooks onto your pet’s harness. No assembly required as this is a ready-made mini chair that fits right into your car and attaches easily to the car seat. Why We Like It – If you have two smaller pups, you really get a bang for your buck with this car seat. 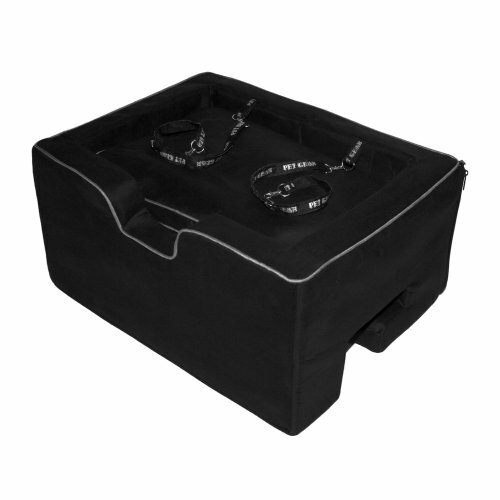 Fit both your pooches easily into this large booster seat so they can have company while enjoying the ride. This car cuddler as it’s called really does solve a lot of problems. 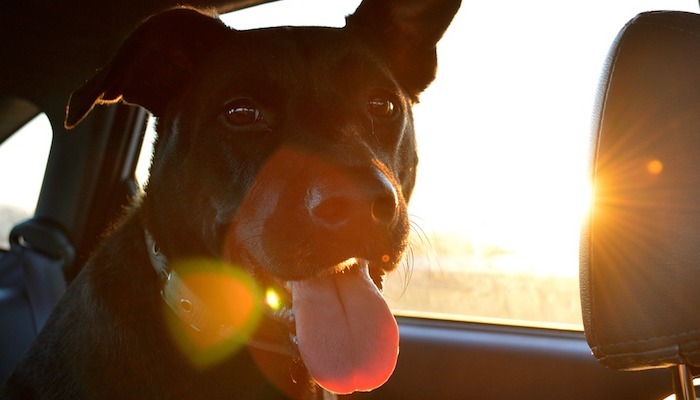 Keep your pet close to you and comfortable on long road trips. 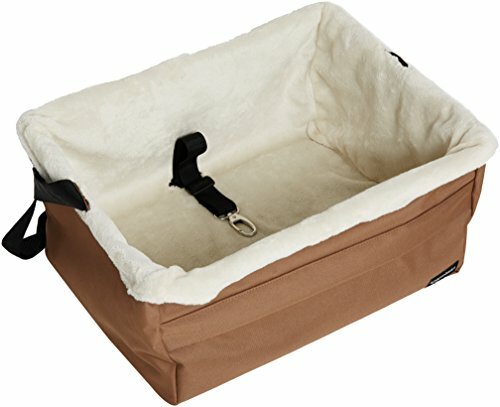 Another microsuede design with faux sheepskin and oversized polyester to give your dog something similar to a doggy bed. 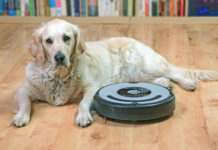 The materials used keep your pet’s loose fur from flying about and saving you the hassle of cleanup. There is an adjustable strap that fits over the headrest and a device that fits between the seat back and seat bottom to keep this cuddler in place. Also easy to clean, make sure you remove the bolster filling inside before using cold water with mild detergent. Why We Like It – This dog seat/bed fits pets up to 30lbs. For those with pooches that like to lay flat, this is a good option. They have enough freedom to stretch their legs but still be safe with the safety harness. Just looking at the design, you know this option is built for functionality and safety. The big pocket sewn on the front gives you a space to store toys or even little treats to keep your fur baby occupied. 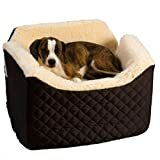 Mostly made of oxford cloth, this option is sturdy and resistant to your pet’s scratches and bites. The waterproof material protects the interior of your car from any accidents or spills that may happen along the road. Fancydeli supplies a 2-year warranty along with this product, 100% satisfaction guaranteed. Why We Like It – It looks like a stocky box that takes up a lot of space, but in reality, this car seat is very easy to install and remove. It’s a foldable design that allows you to store it anywhere to save space. We all love it when a purchase comes with free gifts! This cozy looking little booster seat comes with a collapsible silicon dish for eating on the road, a clip-on leash for added safety, and a custom fit plush blanket just for your fur baby! It looks super fuzzy and comfortable, but it is also water resistant. If a spill happens, just simply remove the lining and throw it in the wash. Just set it up once, and you can easily slip it on and off your car seat with ease. If you decide to take a trip without your pup, simply collapse the car seat and throw it in your trunk and you’re good to go. Why We Like It – When a product comes with a lifetime warranty, you know you’re getting a premium quality product. If your pup isn’t 100% satisfied, you get your money back! Urpower takes the traditional hammock and upgrades the design by adding two flaps on the side to keep your pup from falling out the side. The side flaps also protect your car door from scratches. This is a very large option that can take up your entire backseat. For those of you with kids, the versatile split zipper allows pets and kids to share the same space. The waterproof and wear resistant Oxford fabric makes this a heavy duty but comfortable addition to your car. This dog hammock is easy to install with quick release clips. Keep the inside of your car and this hammock clean with a damp cloth, or a cordless vacuum for dog hair. If you don’t have a lot of time on your hands, simply throw it in the washing machine. Why We Like It – Other than being a hammock, this design also serves as a seat cover to protect the inside of your car. You will finally have the option to drive your pet anywhere with no second thoughts. This comfortable car seat is meant for pups up to 20 lbs. Easy to install with quick release buckles and a short clip-on leash, you won’t need to strap your dog in and make it feel constrained. 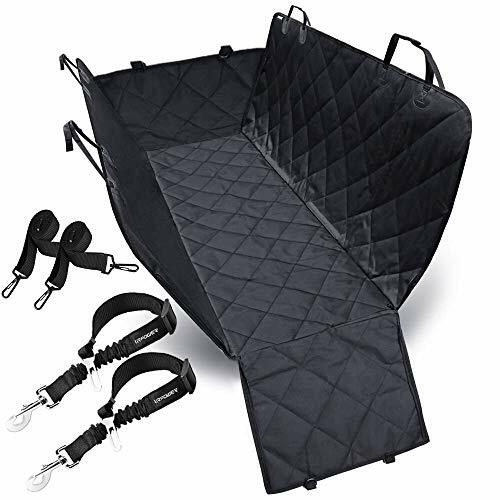 What’s important for pet car seats is to be waterproof, we all know dogs can get up to no good when they’re bored and this car seat is no exception. The water-resistant bottom will protect your car from any messy mishaps. With an elevated view giving your dog the perfect lookout spot, you will be able to pay full attention to the road. Why We Like It – Give your pet the safety and comfort it deserves with this booster seat. Toss a treat or toy in with him and your pup will be happy, safe, comfortable and occupied for hours. Traveling with our fur babies can be such a hassle. We have to make sure they are securely strapped in, won’t make a mess, and are comfortable. A dog car seat of any sort of design is the answer to your problems. Keep you and your pet safe by giving them the cozy space they need to relax but also enjoy the view, while you can give your full attention to what’s happening on the road. But again, even with our narrowed down list of 10 options, you might still find it tough to make the right decision. To further help you, we’ll break down the key things to look for when buying a doggy car seat. Before safety is even in the equation, you have to make sure the seat you buy is even usable. To do this, the car seat should be easy to set up. Most dog seats and most of the options above are easy to store. The collapsible options are great to just slide into your trunk. For those of us without the need for all 5 or 7 or 2 seats in the car (depending on the model of your car), and would prefer to have a permanent seat for your dog, the dog seats that don’t fold could be a better option. For safety, you must look at 2 distinct factors. One is how the seat is secured in place in the car, and the other is how your dog is secured into the dog seat. The dog car seat you purchase must have strong buckles that are heavy duty. Do not purchase one with flimsy material. The best kind of dog car seat will fit with any seat, both the front and the back. An easy thing to remember is, the more adjustable belts it has to fasten the seat in place, the safer it is. For the dog car seat to come with a safety leash or harness is another added feature that you should look for. Either that or straps to strap the dog in a place that latch onto the harness is another good option. Of course, soft material and extra padding make a car seat comfortable for your pet. But other than that, the seat needs to be spacious enough to give your dog sufficient room to relax. Whether your pooch feels like laying down, curling up or sitting up straight, it should be able to do that with ease. If your dog isn’t granted with these basic comforts, it will get fidgety and agitated, and therefore affecting you and your trip. 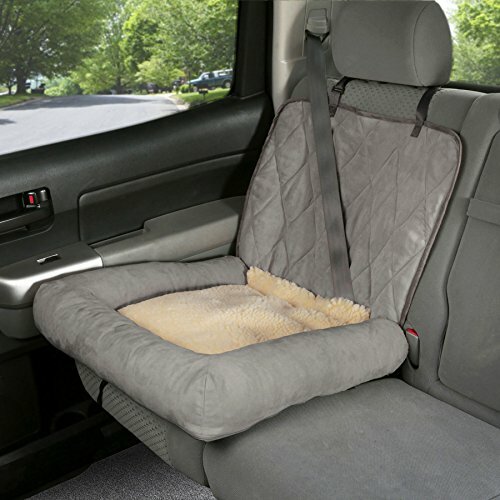 The material used in making the dog car seat will determine its quality and durability. Not only that, just for convenience purposes, waterproof and wear resistant material is also preferred. Traveling with a pet can be a hassle and messes happen. Waterproof material can keep the rest of your car clean, and be easily machine washed. Although all dogs or any living being for that matter should be safe in a moving vehicle, dog car seats benefit smaller dogs more. If you have a small to medium sized dog, a dog car seat is a necessity. They provide security, so if an accident was to happen, your dog would be safely held in place. Aside from the safety aspect of things, dog car seats are also there for soothing and emotional purposes. A dog car seat will give your dog the comfort it would have at home in its own bed. A huge plus to dog car seats is it helps combat motion sickness. Some dogs may spend the whole trip running rampant throughout the whole car, interfering with your driving and the ride just to see out the window. Elevated booster seats can keep them occupied. If your dog has any of these tendencies or you just want him/her to be safe, save yourself from worry and stress and purchase a dog car seat today. We’re going to be completely honest with you and lay out the truth. Nothing is safe 100% of the time. Dog car seats are the best things on the market right now for small-medium dogs that ensure their safety during transport. They are commonly designed to resemble a dog bed that we can securely buckle in place and comes with a safety leash or harness feature. As we said above, make sure the dog seat securely fastens to the seat of the car, and the leash or harness keeps your dog securely in place without hindering its mobility. Dog seats can provide stability and therefore decrease the chances of motion sickness for your dog. If they are distracted or bored, they can interfere with you driving, or start crying for attention. Giving them the option to look outside can save a lot of the headache. Bucket Car Seats – These are for slightly heavier and larger puppies, as the design has a removable seat cushion that gives taller pups more space. 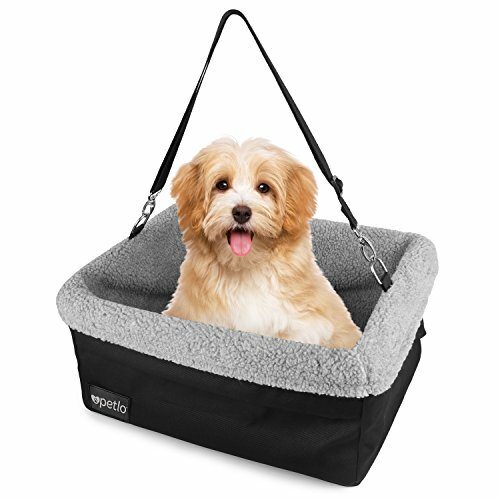 Booster Pet Seats – These pets seats are great for the smaller pet, they are elevated options to give your pet the chance to look out the window. Car Hammock – For any sized dog, but preferably larger, the hammock gives your pet all the space it needs to feel at ease. For large dogs, instead of car seats, look into car seat belts to strap them into place without the extra little seat, just as you would a child. This dog seat comes highly rated. If you have a larger pet, get a large size. The dual security latches provide enhanced safety. If your dog still isn’t quite large enough to look out the window, the elevated seat can help with that. Suitable for the front and back seats you can set up this comfy chair wherever you please. 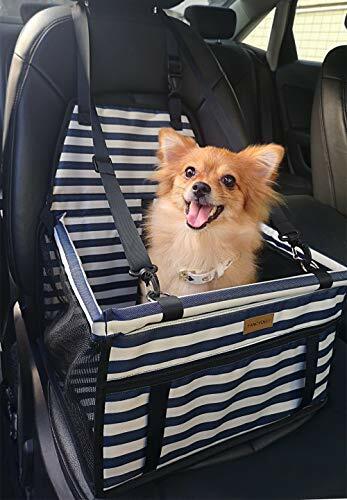 This is one sturdy design that has all the perks a dog seat should have- waterproof and comfortable material that’s easy to clean, sturdy design, easy installation, foldable and easy to store, and a warranty with a front pocket to store treats. What else could you ask for? A dog’s happiness and safety is our responsibility as pet parents. We always want them to feel comfortable on the trip, and it eases our minds to know they are safe. Just like a child, we must consider all the ‘what if’s’ when we have a fur baby. It’s better to set up a booster seat in the back seat of a car because the force of the exploding airbag could do more harm to your tiny pup than the accident might. Give your dog the safest and most comfortable option with a new car seat today! Make your next road trip a quiet and enjoyable one. Much like with the dog sling, never attach the seat tether straight on your dog’s collar, as it could be a choking hazard. The best way is to attach it to their harness instead. This bucket or booster car seats are great for not only dogs, but they can be for any sort of pet that can fit and have a collar, like a cat, ferret or bunny rabbit! K&H Pet Products Bucket Booster Dog Car Seat Small Gray 14.5" x 20"